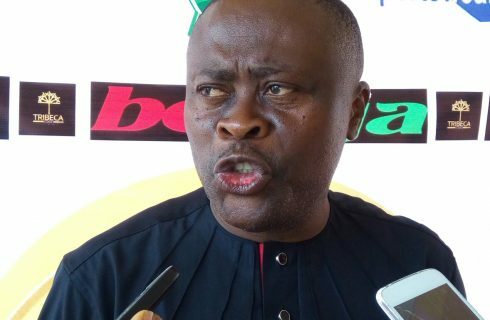 Remo Stars owner Kunle Soname has laid the blame for his team’s one all draw at home to Bendel Insurance and the subsequent fan orchestrated violence against the match officials on the “incompetence” of “completely useless” centre referee Bethel Nwanesi. Remo Stars were held to a one all draw at the Gateway International Stadium, Sagamu after Victor Mbaoma canceled out Charles Omokaro’s 54th-minute opener for the visitors. Remo had a penalty shout waved off in the 60th minute and had a goal disallowed for offside late in the second half to the consternation of the home fans who assaulted the match officials after the match. Mr. Soname though, appeared to absolve the home fans of any blame suggesting instead that Bethel Nwanesi – the centre referee – had made “fans go berserk” with his officiating and also vowed to take up his reservations about the referee’s performance “all the way to FIFA”. “We are going to officially write to the Nigeria Referee Association (NRA) to complain about this officiating,” a visibly angry Soname told the media after the match. “They must take the tape and review this tape and they must sanction the referee if he is culpable. If he has done things that are wrong, he has to be sanctioned because these are things that make fans go berserk. “There’s a problem, look, this causes things if not for the fact that we have a lot of policemen on ground what will have happened here today? Would this guy have gone free? No! They would have injured him like exactly what happened in Plateau (where fans of Plateau United assaulted centre referee Sam Agba following their draw against FC Ifeanyiubah on the opening day of the season). Mr. Soname also described the referee as “a killjoy” and “completely useless” whose officiating soiled the “artistry” displayed by both sets of players. Pictures which later appeared on social media showed that contrary to Mr. Soname’s claim that the referees left unscathed, Bethel Nwanesi was left with a gaping head wound and bloodied clothing following a violent assault from fans suspected to be supporters of Remo Stars.